Check out the Newly Renovated Cal Fitness Center! 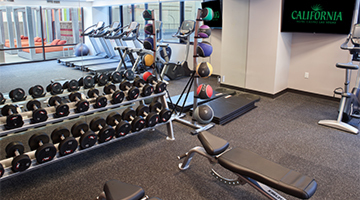 The Fitness Center has everything you need to stay in shape after indulging in one of our fantastic restaurants. Offering multiple options to suit your exercise needs including Treadmills, Ellipticals, Exercise Bikes, Yoga Mats, a Functional Trainer and much more! Fitness Center for registered hotel guests of California, Main St. and Fremont only. Please be prepared to present room key upon request. Reserved for guests 18 and over.